This page is a repository for our efforts towards the 2014 UAV Outback Challenge (OBC), held in Kingaroy from the 22 – 26 September 2014. This final rules for the competition are available here. 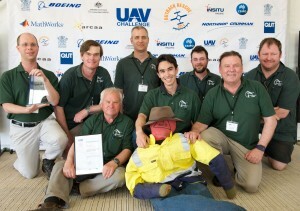 CanberraUAV successfully completed the OBC and came first place. Out of the 16 teams present, 4 were able to drop a water bottle to within 100m of Joe. This was a significant improvement of the 2014 OBC, where no teams were able to drop the water bottle. 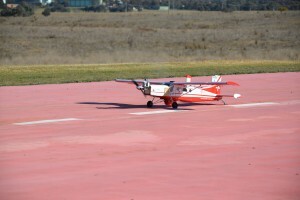 The airframe used was a VQ Porter model aircraft fitted with a 35cc engine and 22×10 propeller. It contains a 4L fuel tank, giving an estimated flight time of 1.5 hours at cruising speed (33m/s). 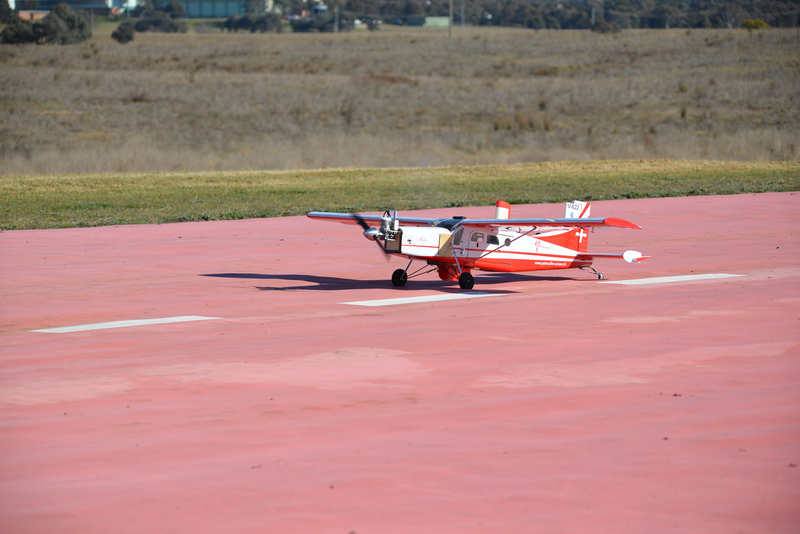 Takeoff weight is approximately 12kg. It should be noted that the Porter was our backup airframe. Our primary airframe was called the “Bushmaster” and was slightly larger and heavier than the Porter. It was custom built and featured many hatches and internal shelves for avionics. It was also able to fold in half to fit in the boot (and folded back seat) of a standard station-wagon car. Unfortunately, the Bushmaster suffered a series of accidents (major and minor) in the months leading up to the OBC. We then had to make the difficult decision to stop work on the Bushmaster and concentrate our efforts on the Porter. 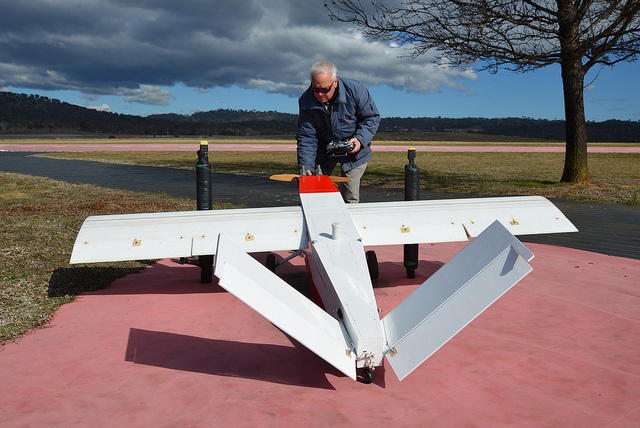 The flight controller was a 3DR Pixhawk running the current (at the time) APM:Plane software – version 3.11. This was connected to several external sensors, including 2x 3DR GPS modules, digital airspeed sensor and a Laser range finder module for approach and landing. 2 digital radio links were used, in order to provide redundancy. 5.8 GHz link – 2x Ubiquiti M5 Rockets. A steerable dish antenna (28dBi) on the ground and a dual dipole (10dBi) on the UAV. All antennas were MIMO. 928 MHz link – 2x RFD900 radio modems. 2x 6dBi Yagi antennas on the ground. 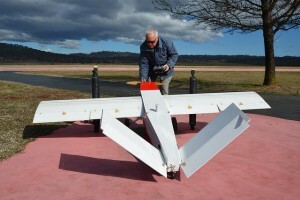 2x 3dBi PCB flex antennas mounted to the tail of the airframe. We used the same camera as we did in the 2012 OBC – the PointGrey Chameleon. 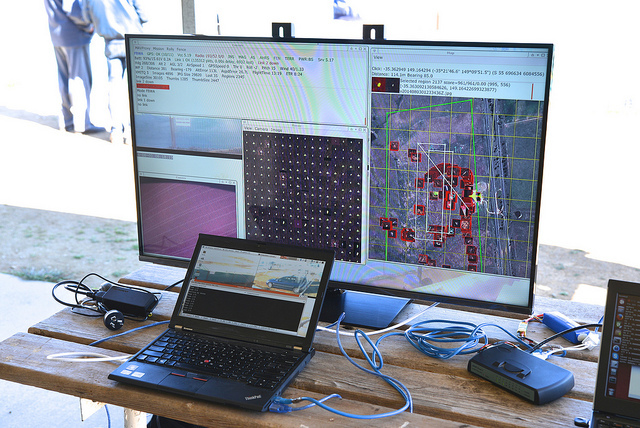 The image processing board was an Odroid-XU running Ubuntu 14.04 as the operating system and our custom developed cuav library as the image processor. It also ran the MAVProxy software to monitor and send commands to the flight controller. The ground station used a van for transportation, power and shade. The rear of the van housed a 42″ LED television, used for displaying critical flight information. A tent surrounded the rear of the van, providing shade and glare protection to the GCS team. 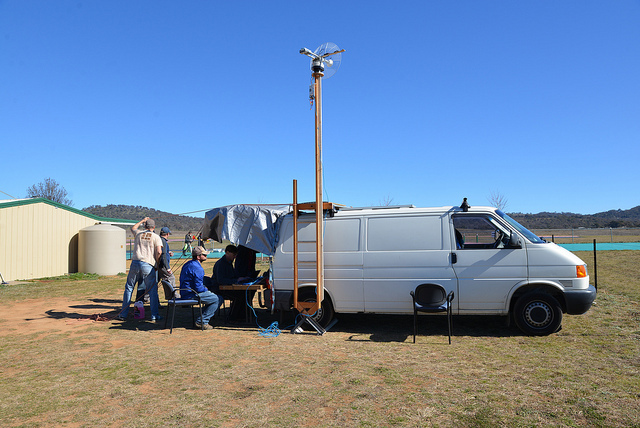 The aforementioned radios were on a 4m pole next to the van. The 5.8 GHz antenna was automatically steerable and tracked the UAV throughout the flight. The steering mechanism used a few scavenged stepper motors and a Pixhawk (running the APM:Plane in antenna tracker mode). This was in turn connected (via a low power 433 MHz radio link) to a GCS laptop which provided a telemetry stream telling the antenna tracker what the UAV’s current position was. The GCS network consisted of 3x laptops running various flavours of Ubuntu, connected to an ethernet switch. The telemetry would come down to the master GCS laptop which would, in turn, distribute the telemetry to the other two laptops. All the laptops ran the MAVProxy ground station software. The full logs of our flight are available on Droneshare. Our collected imagery is kindly hosted by CSIRO. Our flight operations and checklist manual is available here.